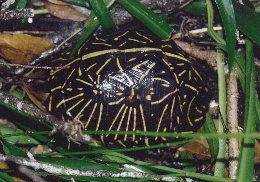 The Florida box turtle is one of the four species of box turtles found in Florida. 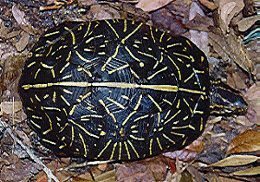 The Florida box turtle is easily distinguised from others by the bright yellow radiating stripes on the shell. 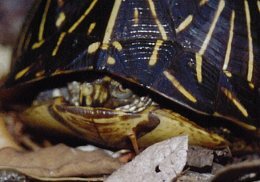 Box turtles have high-domed shells. This side view shows the domed scutes. The hinged plaston is another characteristic. It allows the shell to close tightly. The turtle in its "form", a slight depression within the leaf litter and low plants where the turtle spents the night and inactive daytime periods.